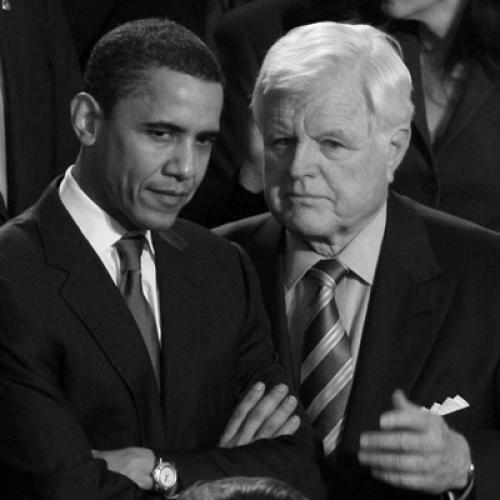 Ted Kennedy’s seduction process and the utter shamelessness of Kent Conrad. This is the second of a five-part series explaining, in remarkable detail, how Obama and the Democrats came to pass health care reform. (Click here to read part one.) Be sure to come back Monday for the third installment, which examines just how nasty negotiations got in Congress—bruised egos, threatened careers, the works. It was an intimate gathering at Ted Kennedy’s home in Washington—just the senator, his colleague Max Baucus, and three senior staffers who worked with them on health care. Kennedy, who loved historical artifacts, pulled out an original version of the Federalist Papers that his wife, Vicki, had given him as a gift. He also demonstrated one of the home’s architectural quirks: a hidden bar, accessible through a secret door in the sitting-room bookcase. Outwardly, Kennedy and Baucus were different in every conceivable way: Kennedy commanded a room, spoke with a booming New England accent, and had a flair for the dramatic. Baucus seemed uncomfortable in his own skin, mumbled through public statements, and preferred to make his mark by negotiating deals across a table. The ideological differences were starker still: Kennedy was one of the few Democrats who still relished the label of “liberal.” Baucus came from Montana, maintained one of the most conservative voting records in the Democratic caucus, and routinely antagonized his party’s base. During the Bush era, he famously broke with party leadership and cut deals with Republicans over tax cuts and the Medicare drug bill. When he showed up for the final Medicare drug vote with a black eye, he joked that he’d gotten it at a Democratic caucus meeting. Baucus had the ability to kill legislation. Kennedy’s Health, Education, Labor, and Pensions (HELP) committee has the word “health” in its name, but Baucus’s Finance Committee is the one that oversees government revenue, Medicare, and Medicaid. In 1993 and 1994, Daniel Patrick Moynihan presided at Finance. Moynihan, eager to pursue welfare reform instead of health, basically declared the Clinton plan dead on arrival—and, then, helped make it so. But Baucus wasn’t running away from comprehensive health care reform. He was embracing it. He thought of himself as a senator with a history of passing major legislation—not just the Medicare drug bill, but also the Clean Air Act Amendments of 1990. And he was able to do this, he thought, precisely because he was willing to reach across the aisle in a way Democrats to his left wouldn’t. He had started talking about health care reform right after the Medicare drug fight, and, in 2008, he began preparing for it in earnest. To lead his team, he brought back Liz Fowler, who had left his staff in 2005 to work for WellPoint insurance. To arm his committee with financial information about industry, he later recruited Tony Clapsis, a former Barclays analyst. The ties Fowler and Clapsis had to business were typical of Finance and a major reason so many reformers distrusted the committee. Sometimes, those appearances were deceiving; after WellPoint had fought efforts to bring Massachusetts-style reforms to California, Fowler told friends she was frustrated with the company’s right-wing politics. But, with the revolving door between the industry and committee staff, not to mention the campaign donations the industry made to the members, trade groups had no problem communicating their feelings—and getting responses. Kennedy was also thinking ahead. He convened a set of confidential meetings among what he called the “workhorse group.” The group included reform advocates and health care trade groups; the idea was to create inside-Washington momentum for reform while developing a proposal that at least some, if not all of the groups could support. The two started meeting regularly and, by summer, the chairmen were aiming to produce one common piece of legislation. That hope subsided with Kennedy’s infirmity, but Baucus didn’t back off—not even when that fall’s financial crisis gave him the perfect excuse to relent. On the contrary, Baucus redoubled his efforts and announced as his goal the production of a white paper sketching out what legislation should look like. He published the 89-page document in November 2008, less than two weeks after Obama’s election. And some of Obama’s advisers used it to press their case for moving ahead: It was proof, they said, that Congress was ready to go. But, as pleased as Obama’s health team was with the white paper, they also felt trepidation. Baucus’s staff had been briefing Obama’s team through the fall, but more to keep Obama in the loop than to seek his advice. It didn’t matter substantively: The white paper framework had the same architecture as the Obama plan. But Obama aides worried that the point of the paper wasn’t simply to show that Baucus wanted to pass reform. It was to show that Baucus wanted to own it. Barack Obama had promised to change the way Washington does business. No more negotiating in the anterooms of Capitol Hill. No more crafting bills to please corporate interests. But Obama also wanted to pass monumental legislation. And it wasn’t long before the tension between the two began to emerge. Obama’s budget message had signaled his intention to push forward on health reform. But it didn’t actually establish spending guidelines for Congress. The real budget, the one Congress uses as its outline for appropriating money over the course of the year, is strictly a Capitol Hill document. The two houses each pass a version, work out a compromise, and then approve it—all without presidential signature. That meant Obama had to deal with Kent Conrad, a conservative Democratic senator from North Dakota who was in charge of the Budget Committee and who feared health reform would be a sinkhole for taxpayer money. To get his support, a bill couldn’t be too big—and it had to pay for itself. Conrad, like other conservative Democrats, was also insistent about finding at least some token Republican support. And that shaped his position on a key procedural question. Under what is called the “budget reconciliation process,” the Senate can pass a bill without the threat of filibuster. That means a simple majority of 50 plus one—rather than 60—can pass legislation. When the budget committees write the budget, they get to indicate what legislative measures will fall under these reconciliation guidelines. Progressive activists and pundits talked openly of using reconciliation to pass an entire health care bill. The Democrats had only 58 seats at that point, since Arlen Specter was still a Republican and Al Franken’s victory remained in dispute. And support from conservative Democrats like Ben Nelson was far from certain. But parliamentary guidelines meant that passing the bill through reconciliation would be difficult, and moderate Democrats complained that the move seemed too partisan. Conrad was among the loudest critics, all but precluding the possibility. Obama still hoped for a bipartisan win. But he and Majority Leader Harry Reid wanted the option of reconciliation, just in case 60 votes proved elusive. Obama appealed to Conrad on substance—dispatching Peter Orszag as emissary and then telling Conrad of his commitment to reform that paid for itself. He also showered presents on Conrad’s dog, a white bichon frise named “Dakota,” which Conrad sometimes totes to his office. The doggie gifts even came with a personal note—“Rahm idea, Obama execution,” says one administration official. But, in a sobering lesson about the realities of Congress, Conrad brought up a local issue. Even as he was demanding Medicare spend less money overall, according to multiple administration and congressional sources, Conrad sought assurances that Medicare would start paying more money to some of North Dakota’s hospitals. Specifically, Conrad wanted the government to pay the hospitals as much as it paid hospitals in Minneapolis, the nearest big city. The sources say Conrad came away thinking he had a deal, while the White House didn’t. (Neither party would comment officially on their negotiations.) Conrad, who has long claimed his states’ hospitals are underpaid, eventually got his payments anyway: The final Senate health care reform bill raised reimbursements for hospitals in five “frontier” states with low population density. North Dakota is one of them. Liberals who knew about Conrad’s demand were furious: He loved to lecture about fiscal responsibility, except when federal money happened to serve his own parochial interests. But, weeks after the 2008 election, one of the first people to approach the new administration was, sure enough, Billy Tauzin. In 1994, the drug industry had helped bankroll the campaign to kill Clintoncare. But, like the rest of the health care industry, it seemed to be adopting a different posture this time. PhRMA and other trade groups had been meeting regularly with pro-reform counterparts, in a series of private sessions convened by Ron Pollack, an earnest universal health care proponent who led the group Families USA. They’d also been part of Kennedy’s workhorse group. They weren’t committing to anything; they could always turn around and oppose reform, as many initially enthusiastic groups had done in 1994. But even some drug company CEOs thought that they were better off shaping legislation than fighting it. Obama’s advisers encouraged that view. Although wary of how the industry wanted to shape legislation, they thought they couldn’t win if most major trade groups lined up against them. During the transition, Tom Daschle agreed to meet with Tauzin and PhRMA’s chief lobbyist, Bryant Hall—who, conveniently enough, had offices in the same building as Daschle’s law firm. PhRMA had worked with Democrats on expanding the state Children’s Health Insurance Program (CHIP), and, the two lobbyists explained, the group could help with comprehensive reform, too. But PhRMA’s tolerance for pain was limited. The drug industry didn’t want to oppose reform, they implied, but it was prepared to do it if the terms seemed too harsh. Daschle, though, wouldn’t be able to see the negotiation through. Obama had tapped him to run health care reform partly because of his Washington savvy. But, in recent years, Daschle had parlayed that knowledge into a lucrative career of advising corporate clients. When investigators on Baucus’s Finance Committee turned up evidence that he’d received more than $100,000 in free transportation and owed considerable back taxes, Daschle had to withdraw his nomination—effectively freezing the conversation while Obama searched for a replacement. But PhRMA was engaged in other negotiations, as well. In January, SEIU’s Dennis Rivera and Karen Ignagni of America’s Health Insurance Plans (AHIP) started talking about a joint industry effort to pledge savings, as part of reform. They met in Washington hotel conference rooms, rather than one of their respective headquarters, in order to avoid attracting attention; as the discussions moved forward, they invited other groups, including PhRMA. They also reached out to the White House, where Daschle’s successor, Nancy-Ann DeParle, encouraged them to take the effort public with a letter and appearance at the White House. The administration thought it would legitimize one of their main arguments: If even the health care industry thought reform could save money, how crazy could the idea be? It’d also make it harder for these groups to fight reform as specifics emerged. After painstaking, line-by-line negotiations over a joint letter, the groups agreed on a figure—$2 trillion over ten years. But confidentiality was essential, because the parties to the agreement faced very complex internal politics. Some hadn’t taken the idea to their full organizations yet; the idea was to inform them over the weekend, right before the Monday event. But the story got out early, apparently because a White House official leaked it. It generated a day of positive, if slightly confusing headlines about the progress of reform and potential to save money. But it also sparked a near-revolt within the American Hospital Association (AHA), whose president, Rich Umbdenstock, hadn’t even told his full leadership the event was forthcoming. PhRMA didn’t recoil in the same way—in part because the group had begun talks with the Finance Committee. This was the kind of deal-making Baucus relished, so he was direct about his position. Armed with estimates from Tony Clapsis suggesting that the drug industry stood to make up to $100 billion over ten years if reform expanded coverage, Baucus asked the industry to reduce its revenues by about the same amount. PhRMA’s lobbyists said that was high, but they were willing to talk. The serious negotiations began after the White House event, in a handful of lengthy meetings in Baucus’s office. DeParle was there to represent the administration, along with deputy chief of staff Jim Messina, who had been Baucus’s chief of staff and whom the Montana senator once called a second son. Tauzin and Hall led the PhRMA team and worked with five, then six, drug company CEOs. The CEOs represented the diversity of PhRMA members—perhaps making any final deal more acceptable to the organization’s whole membership. The CEOs came in with serious questions about whether a deal would hold on the Senate floor and in conference committee. The White House, for its part, was pushing for more than PhRMA wanted to give. In a new book, Landmark, the Washington Post's Ceci Connolly describes one key moment--when Rahm Emanuel called DeParle, just as it appeared the two sides were near agreement. After taking the call outside, DeParle announced that PhRMA had to offer drug rebates to more seniors; Emanuel, it seems, was nervous about reform's poll numbers among the elderly. * But the White House was also anxious to close the deal. The perception of progress and inevitability was crucial to the administration’s strategy: It would help persuade wavering groups and members of Congress to support the bill, or at least dissuade them from opposing it. Reformers frequently used the saying, “Get on the bus or get run over by it.” But that only made sense if the bus kept moving. Eventually, the two sides agreed on $80 billion, some of which represented reduced government spending on public insurance programs. (The rest represented money individuals would save, through cheaper drug purchases.) PhRMA also pledged to support reform openly, by financing pro-reform ads. The ads might not be that helpful, but dollars spent advocating for reform were dollars not spent opposing it—and that, aides would later say, is was what mattered the most. In return, the White House and Finance agreed not to write health care reform in a way that would further cut into drug industry revenues—a promise that implicitly took off the table such ideas as allowing the reimportation of drugs from Canada. *This passage has been modified, in order to make clear that Ceci Connolly previously described the same scene in her published account. Check back Monday for Part Three, which examines just how nasty negotiations got in Congress—bruised egos, threatened careers, the works.